Since our founding in 1956, Ogburn Electric Company has relied on a business philosophy that has resulted in our successful accomplishments and growth. Our commitment and purpose have remained unchanged; Client satisfaction is our ultimate goal and achieving that goal is how our reputation in the industry has been built. We are confident this commitment will lead to our continued status as a leader in the electrical contracting field. Located in the Piedmont Triad of North Carolina, we have evolved into a major, full-service electrical contractor specializing in commercial, industrial and residential work. Our formula for success has been based on providing complete customer satisfaction through innovative design work, coupled with our knowledge of state-of-the-art electrical technology. Using modern tools and equipment and working with the utmost safety, our competent staff continually provides our customers with the knowledge and peace of mind that they have made the correct choice by selecting Ogburn Electric Company as the solution to all of their electrical needs. We have extensive experience in all aspects of the electrical contracting field, including design/build applications, new construction, fire alarms, motor controls and more. Our Estimating Department is ready to help our customers fine-tune their projects and develop ways to meet any of their design/build needs. Add in our team of highly skilled electrical technicians, who are always available for 24/7 emergency calls, and you have a full-service contractor ready to meet any of your electrical needs. 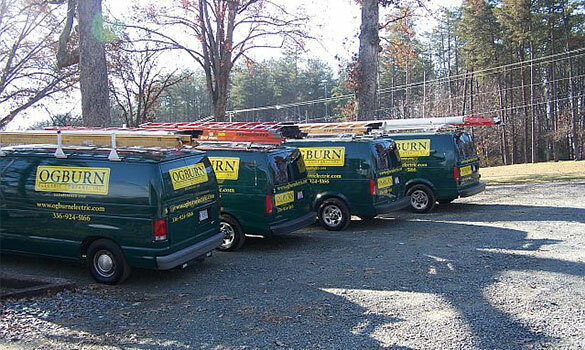 Let Ogburn Electric Company bring your project to the satisfying and successful completion that you deserve.